Mr. Jameel Yusuf Ahmed is a businessman by profession and is the chairman of TPL Corp Ltd. He was the founder chairman of Citizen-Police Liaison Committee (CPLC), and remained its chairman from September 1989 to March 2003. He is also the Director of Asia Crime Prevention Foundation (ACPF) and is the founding trustee of “PANAH”, a shelter home established for women in distress. 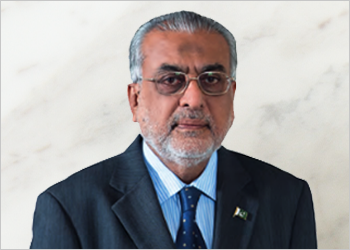 Mr. Yusuf is also a member of Advisory Council Fellowship Fund for Pakistan (FFFP), Woodrow Wilson International Centre for Scholars (WWC) since 2004. He was awarded Presidential Award “Sitara-e-Shujaat” for gallantry services in August 1992 and was also nominated for the First United Nations Vienna Civil Society Award in 1999.